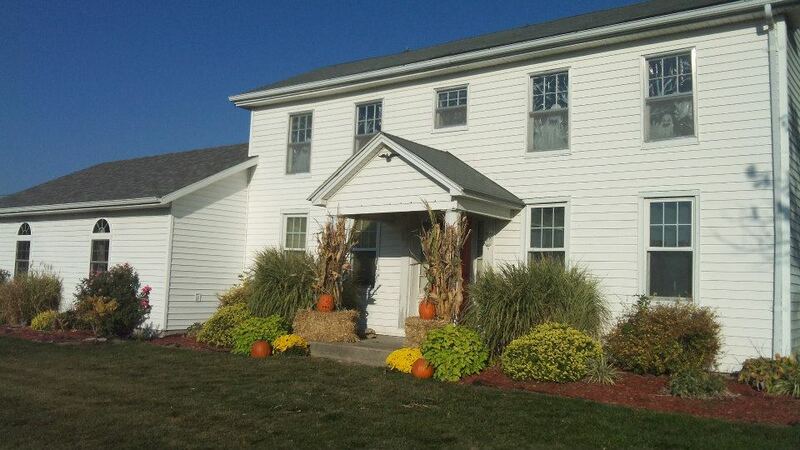 Our home ready for Fall! We have a lot of Amish in our area that sell Mums for $3 each and all sizes of pumpkins, gourds, squash, and other decorating things. We stock up there starting in September. You can get them cheaper than at WalMart or other big box stores and are much better quality. We go out in a huge field of Mums and make our selections. It is usually one of the children that help us. They dig up the ones we pick out and put them in a sack. It’s so much fun talking to them and learning more about how they live. It is so much different than our day to day lives. My dad cut down a bunch of cornstalks out of the field before harvest that I gathered in bunches and tied around the posts on our front porch. I took my flowers out of my planter pots that I had displayed during the summer and replaced them with the Mums. The Mums are hardy and can take the weather here in Northern Missouri since it is starting to get much colder. 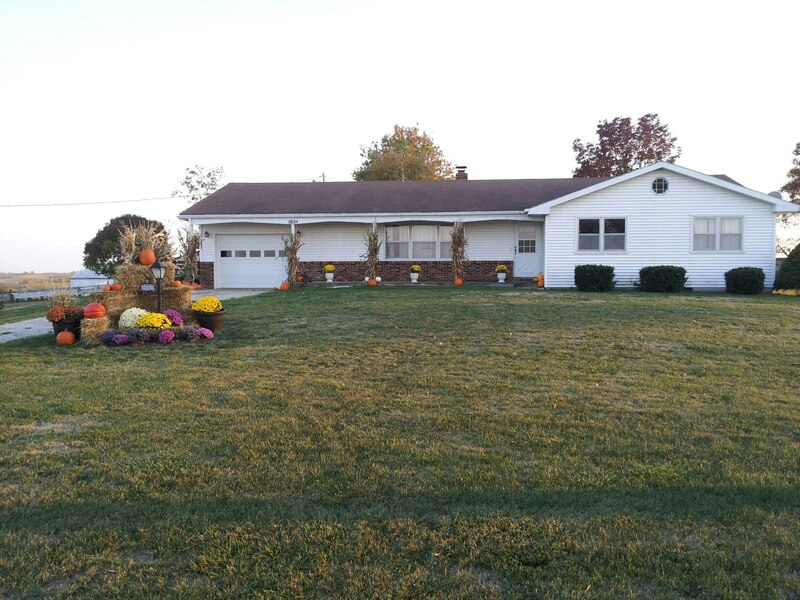 We selected various sizes of pumpkins and gourds and placed them throughout. Here are some pictures of my parents house and how my Mom decorated outside. My Mom is so great at landscaping and gardening. She has taken a lot of time to make all of her flowers and shrubs look so beautiful. The older part of their home was built in the 1860’s and this is where I grew up. They have lived here since they were first married. Can you see the fun ghost window cling decals in the windows? My parents home built in the 1860’s. 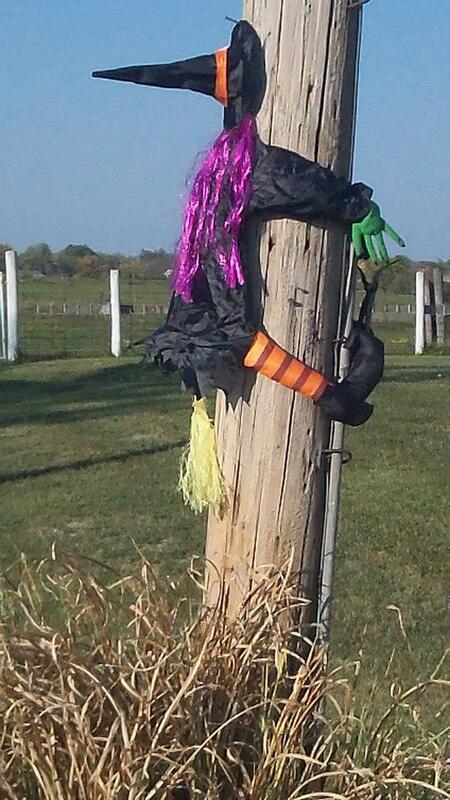 My son had a fun time helping my Mom add this whimsical crash landing witch to the electrical pole by the road. It looks funny when you are driving by their house. Of course, we will be doing some fun pumpkin carving to make some Jack o’ Lanterns and other shapes. I’ll share those once they’re finished. 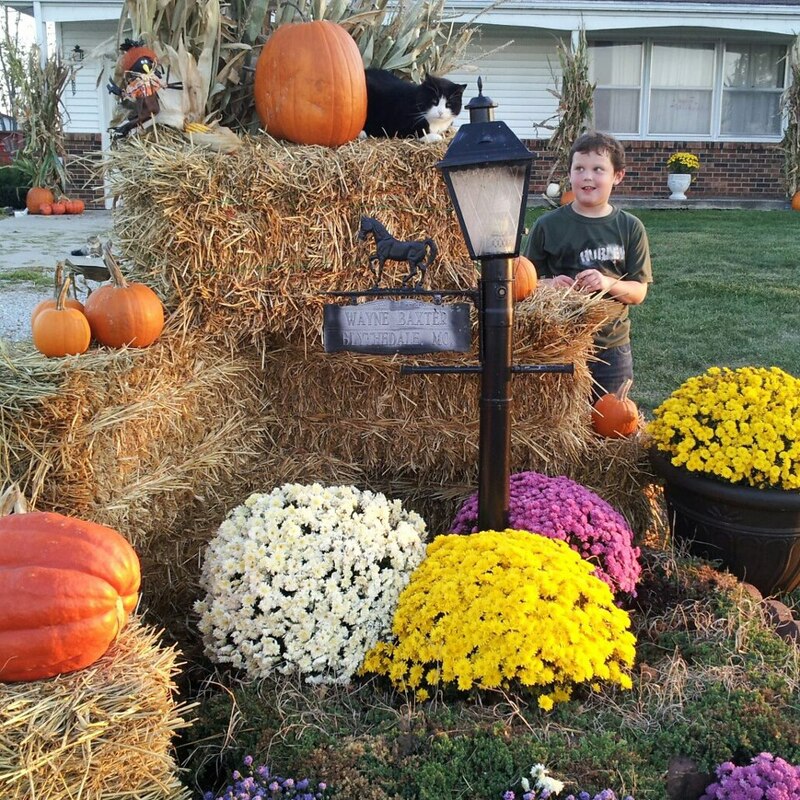 How do you decorate outside for Fall and Halloween? I love that last picture with the crashing witch! soooo funny and cute! So cute! I love that the cat is including himself in the decorations in the first pic. One year we used the gutter clips on our house and steaks in the ground to run Dollar Tree cob-webbing all over our front yard. The kids loved it. My Mom was also very big on decorating for holidays when we were growing up. We can’t afford to do a lot but try and put a little bit out because of all the kids nearby. I love that what you have done is simple yet looks SO great and really just brings Halloween in with a bang! Thanks for sharing! I am dying over here laughing about that witch!! but I have to say the the front yard decorations look fantastic and it reminds me of an entrance to a Hay ride. Super great job! You did an amazing job…I live in an apartment and don’t really have a yard, but we decorated my deck…with a few small skulls and pumpkins. Awwwwwww Just look at the smile on his favorite. Great job their little dude! Your house looks fantastic! I hope you have many on lookers. There’s this block not to far away from us and every year each and every house is decorated with the same theme in mind. This year it’s THE GREAT PUMPKIN “Peanuts”! It’s too cool and they do the same thing at Christmas time! Cars line up to go see it! I love the decorations with the hay and the Mums. Your fall decor looks great! Thanks for sharing. i love how you got your yard decorated,i used to decorate ,but now i live where i have no yard.sure miss not decorating. Love the photos of your yard decorations. Love how the front proch is done. I love how you decorate your yard!! We rent and don’t have a yard, but my husband makes up for it by decorating our apartment. Halloween is his favorite holiday, as his birthday is right before it. We have a lot of cool Halloween decorations. Love the witch decoration on the pole as well. Nice. I so much prefer this more natural look than the ugly plastic decorations people buy. That flowers are beautiful and the color are so vibrant. What kind of flower it is ? I love how you decorated. Even though it is passed fall, I will have to keep this in mind since we now own our own home. I would love to do something like this next year.